We’d love your help. Let us know what’s wrong with this preview of Confessions of the Pricing Man by Hermann Simon. The world s foremost expert on pricing strategy shows how this mysterious process works and how to maximize value through pricing to company and customer. In all walks of life, we constantly make decisions about whether something is worth our money or our time, or try to convince others to part with their money or their time. Price is the place where value and money meet. F The world s foremost expert on pricing strategy shows how this mysterious process works and how to maximize value through pricing to company and customer. The recipe for successful pricing often sounds like an exotic cocktail, with equal parts psychology, economics, strategy, tools and incentives stirred up together, usually with just enough math to sour the taste. That leads managers to water down the drink with hunches and rules of thumb, or leave out the parts with which they don t feel comfortable. While this makes for a sweeter drink, it often lacks the punch to have an impact on the customer or on the business. In this engaging and practical narrative, Simon leaves nothing out of the pricing cocktail, but still makes it go down smoothly and leaves you wanting to learn more and do more as a consumer or as a business person. You will never look at pricing the same way again. 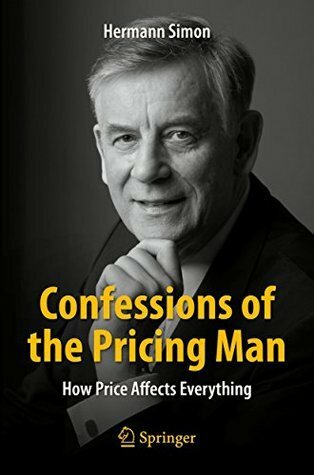 To ask other readers questions about Confessions of the Pricing Man, please sign up. This is a MUST read for CEOs, C-level decision makers and board professionals. Pricing is a way too little understood topic among business professionals. The number one takeaway in this book is to always lead company with profits in mind. Not because of greediness, but because profit is a means survival. And pricing is the easiest, and many times, a powerful way to influence profits. Especially many big corporations and their sales executives are incentivized to care about market share. This typ This is a MUST read for CEOs, C-level decision makers and board professionals. Pricing is a way too little understood topic among business professionals. The number one takeaway in this book is to always lead company with profits in mind. Not because of greediness, but because profit is a means survival. And pricing is the easiest, and many times, a powerful way to influence profits. Especially many big corporations and their sales executives are incentivized to care about market share. This typically leads to large discount campaigns and price wars, and ultimately bankruptcies. The book is really pragmatical. You do not need to have any previous understanding on the topic. There are plenty of real life case examples how certain pricing changes either made a company to thrive or destroyed it. Extremely interesting read. Very interesting piece! I've read few books about pricing, but mostly from psychological ("Irrational Customer", "Priceless" or all behavioral economics books) or very technical ("Price Advantage" etc.) perspective. This book, however, is a solid monography and shows basic principles of how you should price your product. You won't become pricing expert after reading it, but it may change the way you look at prices, profit margins and price/value of products. It made me more interested in the top Very interesting piece! I've read few books about pricing, but mostly from psychological ("Irrational Customer", "Priceless" or all behavioral economics books) or very technical ("Price Advantage" etc.) perspective. This book, however, is a solid monography and shows basic principles of how you should price your product. You won't become pricing expert after reading it, but it may change the way you look at prices, profit margins and price/value of products. It made me more interested in the topic than before. - the last part about more advanced approaches to pricing with plenty excellent case studies and business examples. Fascinating behind the scenes view behind everyday prices we take for granted. A friend has borrowed me this book - it's a great introduction to pricing. (Dzięki Maciej!) A must-read for marketing and sales executives. We've been conducting price management projects for clients in Casbeg before I've read it, but now we will probably do even more of those. كتاب ممتع وشيق وجميل . للاسف تفتقر المكتبة العربية لمثل هذه النوعية من الكتب وحتي لو تمت ترجمتها فانها ستفقد الكثير من قيمة المعلمة. بالرجوع للكتاب فقد وجدته مليئا بالمعلومات الشيقة والمثيرة عن دور الاسعار وقرارات التسعير في تحديد قيمة الشركة وارباحها وحتى مصيرها. كما يلفي الضوء على الاشكال المختلفة لتحديد الاسعار والحصول على اكبر قيمة ممكنة مقابل المنتجات والخدمات التي تقدمها الشركات. Comprehensive, thorough, well-structured book about all things pricing - part management tome, part textbook. Should be read by anyone in sales, marketing, management, strategy, or consulting in any of these functions. Every CEO or Business owner MUST read this book! Price is one of the variables that can completely change the course of a business (for good or bad) yet it is the variable that gets the least attention. Hermann Simon has been a pioneer and leader in the pricing industry for decades and here he shares, in a concise way, the most valuable and actionable insights. My biggest takeaway is that no matter the industry you operate in, the size of your business, or the business model you implement, you sh Every CEO or Business owner MUST read this book! My biggest takeaway is that no matter the industry you operate in, the size of your business, or the business model you implement, you should invest some time in understanding the pricing dynamics surrounding your business ecosystem and creating models to maximize value using pricing strategies and tactics. "Companies with dedicated pricing departments had 24% more pricing power than companies without such departments." "In other words, the pain we feel from a loss is greater than the happiness we feel from a gain, even if the magnitude of the loss and gain themselves is equal." Interesting book for anyone who’s ever asked himself about any of the different pricing strategies/methods and how they impacted growth. I particularly appreciate the high practicality of the book: Real case studies given as examples, hard data that helps readers picture the insights a bit more rationally and above all well thought recommendations from the Pricing Man himself. I enjoyed reading it and won’t be surprised if I find myself scrolling it’s pages again and again. Some good points on the main subject - pricing. It's not eye opening, but as a beginning entrepreneur you can benefit from disclosing such terms as price elasticity, volume vs. margin and details of efficient sales in luxury, premium and low-cost goods. The whole book lacks checkpoints or main lessons emphasized. Even knowing that this is a complex subject, I would like to see less case studies and more of the author's views on pricing. Especially second part was really tough to go trough. An absolute must for anyone who sets prices, an informative read for everyone. The pricing man goes into great depth into how pricing is the ultimate lever that has the power to make or break a company. The book is full of practical examples and thorough explanations. A must read book for who wants to know how to set pricing for his business. Book has full of cases about pricing and exclusively focuses on pricing. One of the books I keep referring to again and again. This book can possibly save anyone years of figuring out how to price products, your time and innovation. Pricing, an undervalued aspect of management and marketing. -He makes a strong argument for pricing to maximize profit - not market share or revenue. Sometimes a higher price will result in lower sales but a larger net profit at the end of the year. -Consider how to package things to create loyalty incentives - ex. train pass that you pay for up front and then get 50% off all of your rides - it encourages you to try and use as much as possible, which generates more business for the company. Good book on pricing, with lots of experience, tacit knowledge and examples. Also good if you're into strategy and positioning. Great book to give a new perspective.. In the normal routine one seldom notices the the effect of prices. This book gives a superb view. must read for sales and marketing professionals.